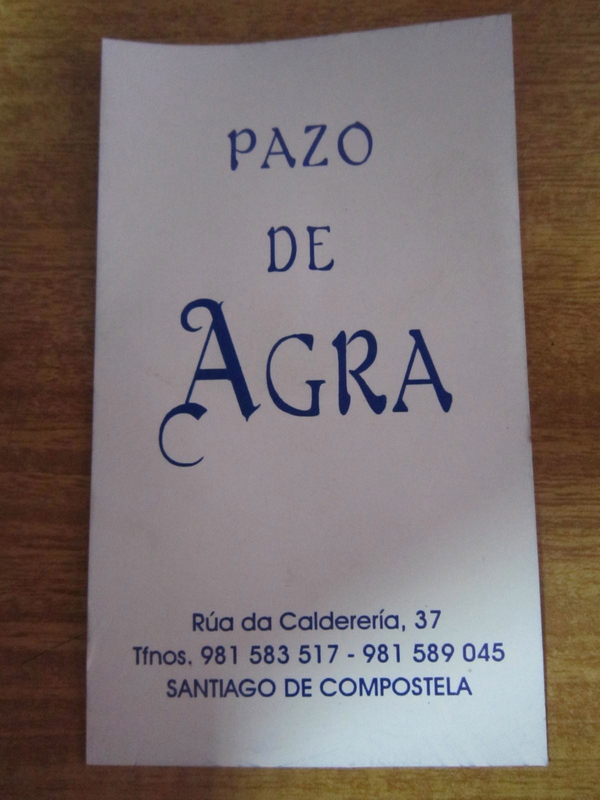 For backpacker and flashpacker pilgrims looking for a recommended night’s stay when they reach Santiago. 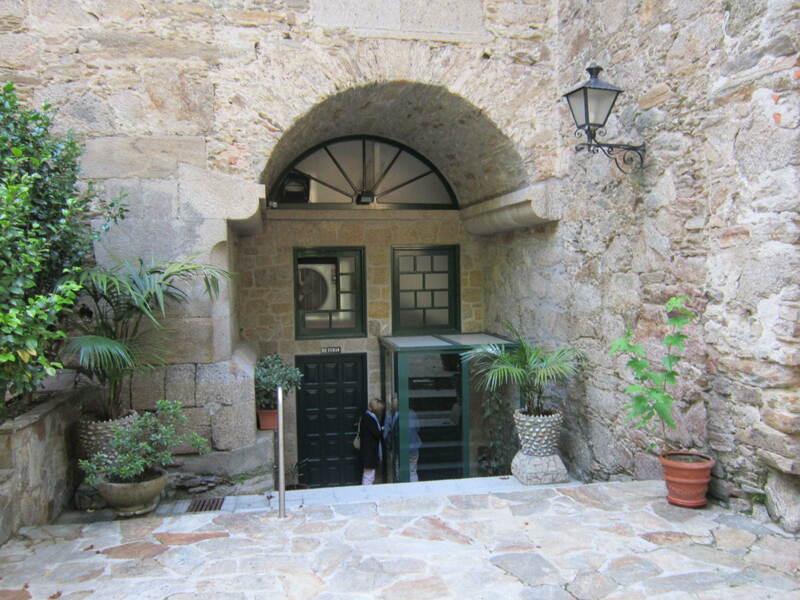 This excellent donativo albergue option in the centre of Santiago de Compostela is located on Rua Castineiros; steps from the San Francisco church at the top of Rua de San Francisco and about a 5 minute’s walk from the cathedral. You can ask here if they have available beds, or you can also ask in the San Francisco church located around the corner if any of the monks are available to be asked. Please note that a special compostela is being issued this year by the monks at the San Francisco church and this certificate is only issued every 100 years; 2014 being the current centenary year. 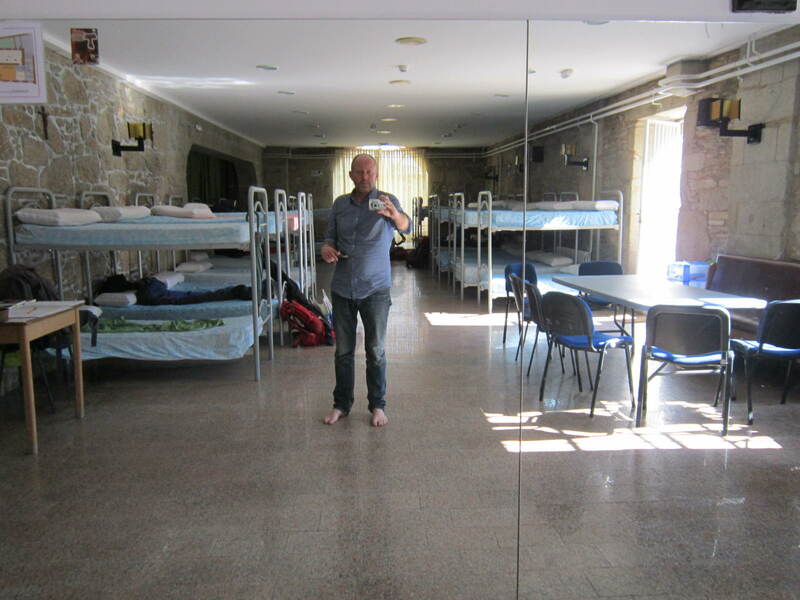 This albergue is technically a donativo albergue but when I arrived with other pilgrims we were told and then reminded that a minimum 5 Euro donation was mandatory for a night’s stay here, but without being told how or where to donate this amount. It transpired in the end that nobody was asked for any payment throughout our stay at this albergue, although I would have gladly paid the 5 Euros had I been asked. The albergue officially opens for checked in pilgrims at 5pm, which is really quite late in the day and they have a 9pm curfew when the doors close and everyone is expected to turn off lights and turn off any noise. In the morning pilgrims are expected to be out by 8am, which is standard. I originally turned up at around 12pm to ask if they had available beds and I was told that I should go to the church to register and leave my backpack there until 5pm when I could move to my bed. It felt a little disorganised and there was no way I was going to leave my bag anywhere, but it worked out and at 5pm I had my bed and despite being high season there were quite a few beds left free (I guess because pilgrims are mainly unaware of this albergue option). The bed was very comfortable, the showers were excellent and security was also excellent with the main door being locked at night and there always being at least one of the church staff in the dorm room to make sure everything ran smoothly. Unfortunately though no food was provided. In the evening at around 6pm we were told there would be an evening mass for pilgrims at 7pm at the church and we were pressurised a bit into attending the mass. It turned out though that the mass was well worth the visit as it was held by one of the monks who brought us all into the service with hand holding and hugs, in one of the upper rooms of the monastery. We were each given a stone with a yellow arrow on it and I still have mine, sitting on top of my desk printer as I write this post and with its arrow facing vaguely towards Santiago. It was a very special moment and rekindled that spark of Camino magic. 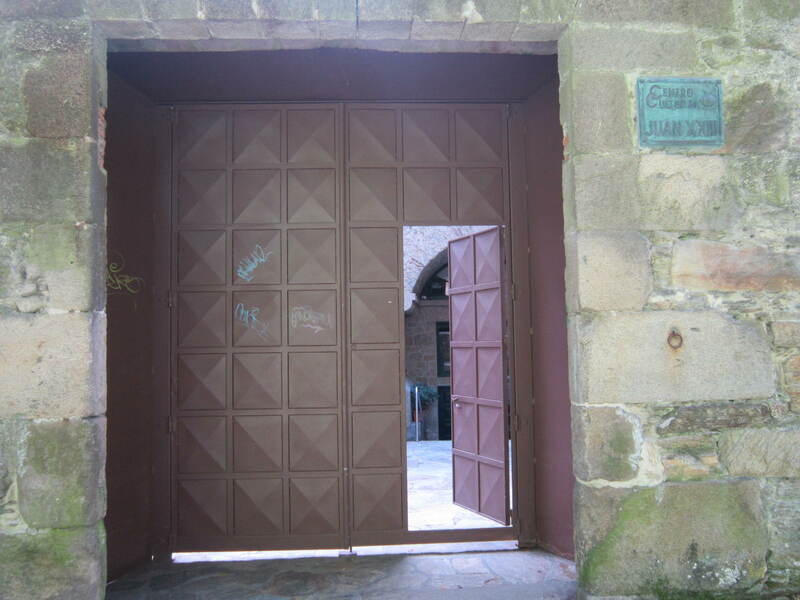 I was fortunate to stay at this flashpacker option twice on my last trip to Santiago de Compostela; once in one of their double rooms and once in one of their single rooms. 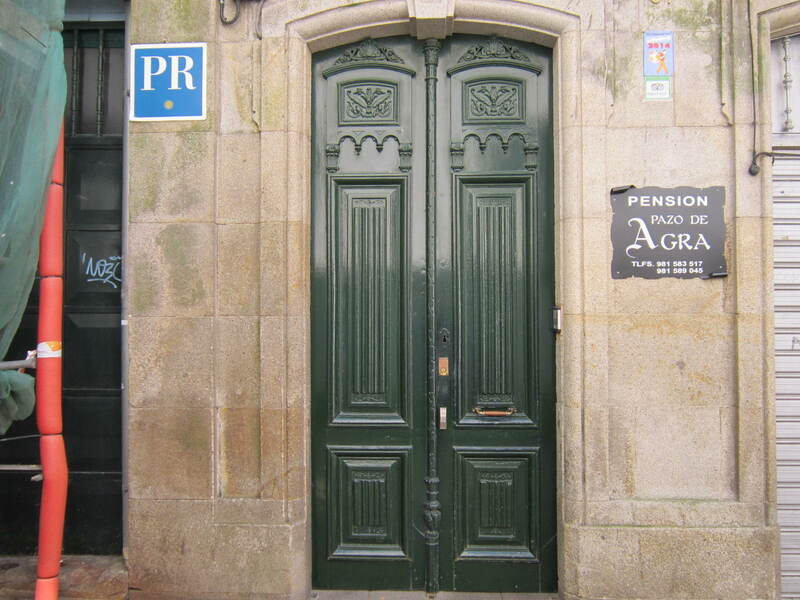 The pension address is 37 Rua da Caldeireria, but the main door entrance to the pension is on the small side street running from Rua da Caldeireria to Praza da Universidade and Praza de Mazarelos. – Single room offered (at time of my stay in July 2014) for 26 Euro. Double goes for more. – Great location in Santiago’s old town. – Clean rooms with complementary internet wifi connection. – Friendly and helpful owners. – Building has a history and is beautifully maintained. – Rooms/bathrooms are quite small and compact, but no more than other pension options in the old city. Tip: My single room had a separate (private) bathroom down the hallway and a balcony which looked onto the quiet side street, but the double room had an en suite bathroom and balcony looking over Rua da Caldeireria. The latter had more of an atmosphere. I did hear some reports of pilgrims having money and belongings go walkabout while staying in albergues in Santiago, though of course at neither of the two accommodation options covered in this article. Apparently one pilgrim even had her boots taken and vowing it wouldn’t hinder the rest of her walk the story told claimed she continued walking towards Finisterre without boots. It makes sense that a city making a fair Euro on the pilgrim ticket would also attract some elements of society looking to capitalise on it for their own personal gain and with no regard for their pilgrim victims. 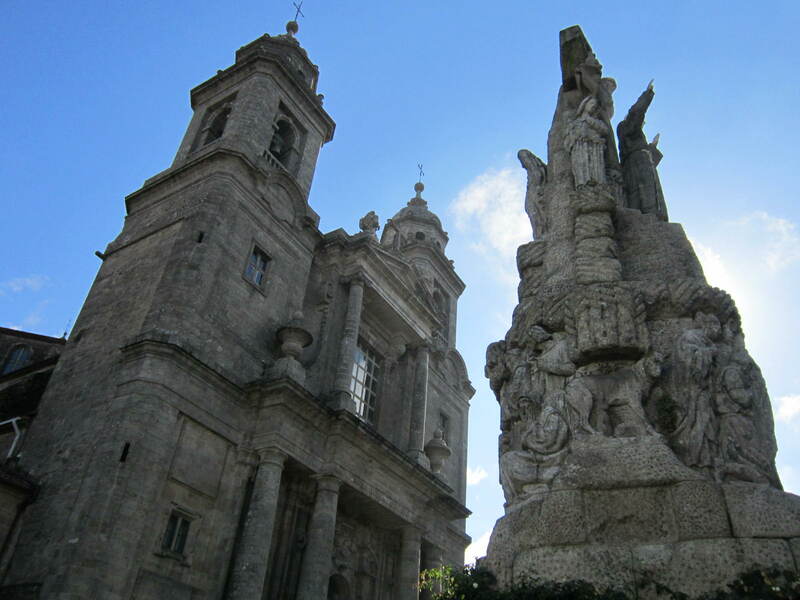 If you have any questions about accommodation options in Santiago de Compostela or if you wish to add information, then please feel free to leave a comment or question in the Reply box below.